Thank you to Douwe Veltman, MRC Laboratory of Molecular Biology, Cambridge for these Dictyostelium images and descriptions. Phase constrast image of a large field of aggregating Dictyostelium cells. Dark field image of a group of Dictyostelium fruiting bodies. Confocal / DIC overlay image of a group of Dictyostelium cells chemotaxing towards a source of chemoattractant in the center of the field. DIC image of a Dictyostelium cell migrating underneath a thin layer of agarose. 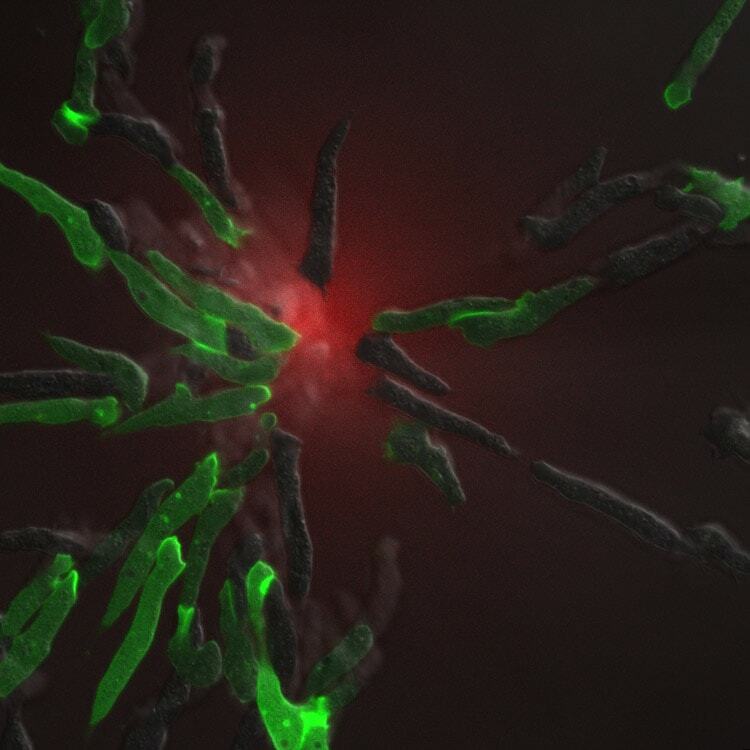 Confocal / DIC overlay image of a migrating Dictyostelium cell expressing a fluorescent marker for the leading edge.